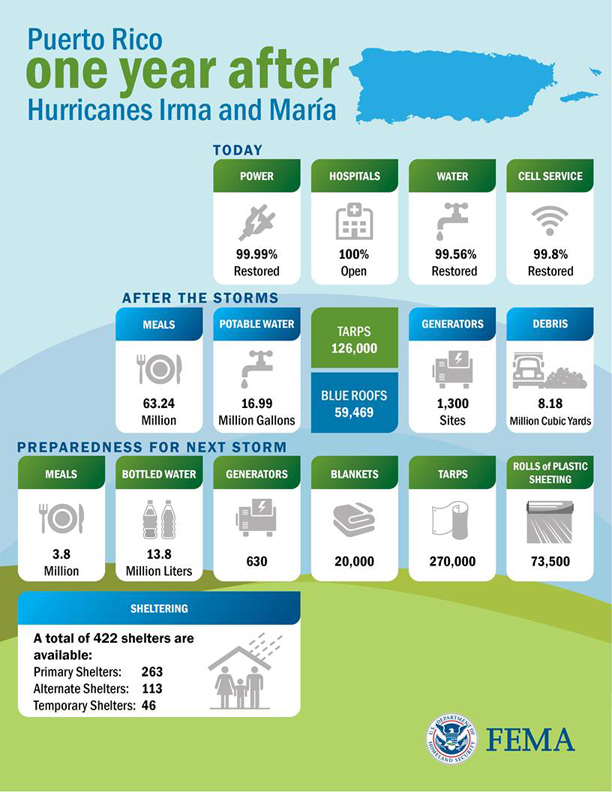 Infographic outlining Puerto Rico one year after Hurricanes Irma and Maria. GUAYNABO, PUERTO RICO – One year after hurricanes Irma and María devastated Puerto Rico, FEMA, its federal partners and the Government of Puerto Rico are undertaking one of the largest post-disaster reconstruction and humanitarian efforts in U.S. history. Major portions of the infrastructure are being rebuilt as federal agencies support the Government of Puerto Rico’s plan to restore the island’s lifeline systems and enable Puerto Rico to withstand the storms to come. In 2017, Hurricanes Irma, María and other disasters affected nearly 47 million people in the United States. While recovery continues, FEMA and its interagency partners remain focused and dedicated to the continued stabilization and resilience of impacted communities. FEMA continues to support response and recovery from hurricanes Harvey, Irma, María and the California wildfires. After Hurricane Maria, Puerto Rico had no electricity, no water, no telecommunications and no transportation systems. Today, electricity is flowing, water systems are operating, traffic is moving, airports and seaports are operating and permanent reconstruction has already begun. Never before has FEMA coordinated federal resources to rebuild an entire commonwealth with a population of 3.3 million people, 78 municipalities, electrical, water and telecommunications systems, seaports, airports, schools, healthcare system, roads and bridges. More than 166,000 homes need repair or reconstruction. * One of largest disaster housing missions in U.S. history. After María, Puerto Rico’s entire electrical grid failed. Nobody had power. In 30 days, 21 percent of customers were restored to power; in 60 days, 49 percent; in 90 days, 65 percent. Today, power has been restored to 99.99 percent of customers able to receive an electrical hookup. Water systems were inoperable. Water service went from 20 to 69 percent operational in 30 days, 91 percent in 60 days. Today, 99.5 percent of water customers are restored. Debris from María and 41,000 landslides shut down all but 400 miles of Puerto Rico’s 16,700 miles of roads, cutting off municipalities across the island. Today, the roads are clear and traffic is moving. María knocked out 95 percent of cellular sites. In 30 days, 61 percent of cellular sites were operating; in 60 days, 96 percent; today, 99.8 percent. More than 462,000 households have received a total of $1.4 billion in FEMA Individual Assistance for essential home repairs, rental assistance and other disaster-related costs. Under FEMA’s Temporary Sheltering Assistance program more than 7,000 families were housed in just over 1,000 hotels in 41 states, the District of Columbia and Puerto Rico. To date, the Tu Hogar Renace (Your Home Reborn) program, administered by the Government of Puerto Rico and funded by FEMA, repaired 68,654 homes. Voluntary Agencies Leading and Organizing Repair, VALOR, repaired 1,403 homes. The U.S. Small Business Administration approved $1.8 billion in low-interest disaster loans to 52,228 homeowners, renters and businesses. The National Flood Insurance Program paid $33 million to policyholders. Eight million cubic yards of debris was removed by the U.S. Army Corps of Engineers and local jurisdictions. USACE installed emergency generators at 1,300 sites to support critical facilities. USACE also installed 59,469 blue roofs and FEMA supplied 126,000 blue tarps for homeowners to install. The U.S. Department of Housing and Urban Development awarded the Government of Puerto Rico $20 billion in Community Development Block Grants to help rebuild housing and meet other community needs. FEMA has obligated more than $3.3 billion in Public Assistance grants to help pay for debris removal, power restoration and emergency services; more funding is planned for repair or replacement of public infrastructure. Puerto Rico’s Central Office of Recovery, Reconstruction and Resiliency reports that 74 of the island’s 78 municipalities have selected recovery projects to help build future resiliency, with the support and guidance of FEMA incident management assistance teams. Puerto Rico’s Emergency Operations Center practiced responding to simulated incidents with support from FEMA personnel. Training also has been provided to personnel involved in health care, energy, water, telecommunications, transportation, debris removal and commodity distribution. The devastating hurricanes and wildfires of 2017 reminded the nation of the importance of preparing for disasters. It is important for residents to prepare in advance to help themselves and their community. Find tips at Disasters Happen. Prepare Now. Learn How.